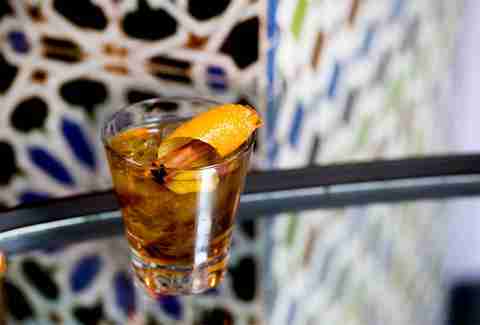 Because, duh, you're definitely drinking something this weekend, make it one (... or 10! Make it 10!) 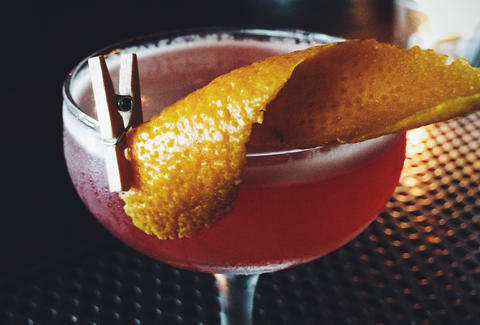 of these brand-new, just-dropped, super-legit LA cocktails. A new autumn mix that might just bring out your Mr. Hyde, Alter Ego is the brainchild of house mixologist Beau du Bois and delivers a round of Cognac, Barolo Chinato, bitters, lemon, sugar, and a splash of Prosecco -- you know, for class. 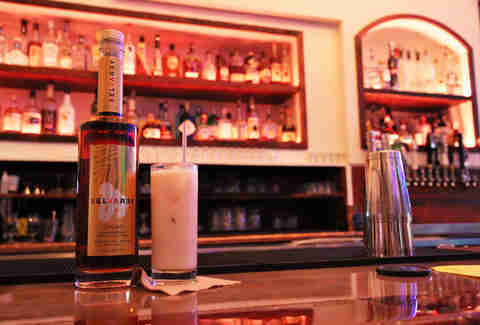 Because booze + horchata = YES, hit this dessert-like cocktail that takes cacao-infused Selvarey rum and pairs it with house-made horchata and a sprinkling of cinnamon. Also, the drink’s name translates to "silver or lead", aka "accept a bribe or face assassination", so that’s pretty badass. 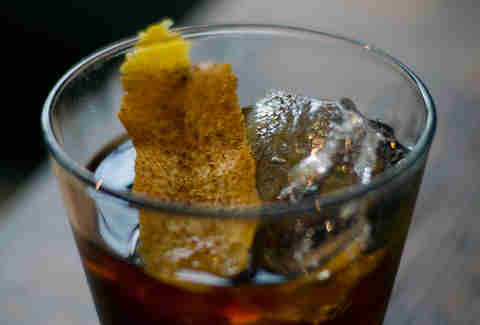 When smoke gets in your eyes, you’ve either been listening to K-Earth too much or you’re sipping on this smoky concoction from cocktail monster Jason Eisner, who mixes 123 Añejo tequila with sweet vermouth, house pumpkin spice bitters, Benedictine, and what's referred to as "smoke bomb love magic". This seasonal specialty (w/ cinnamon whiskey, pumpkin puree, lemon juice, and vanilla extract) from Jonas Lucci is sorta like a pumpkin spice latte, except that it has alcohol in it and... is nothing like a pumpkin spice latte. Remember that time you bobbed for apples in citrus-flecked bourbon? The T-Bizz tastes kinda like that. Bearing the nickname of owner Johnny Zanders' awesomely named Grandpa, this tipple brings together Angel's Envy bourbon, ginger syrup, apple cider, Amaro, lemon juice, Angostura bitters, and memories of hayrides and pumpkin patches. Awww. This fall-licious cocktail features juniper-laden Jensen Old Tom gin, the bewitching herbs of Strega (ahhhhhhh! 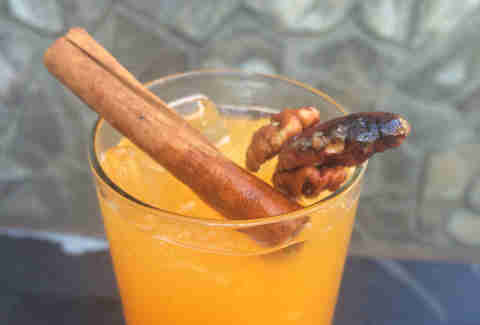 ), the earthy-sweet spice of Geijer Glogg, and the cinnamon and allspice of Bittermens Tiki bitters. Head to this Downtown underground lair with a thirsty group of friends to share their newly minted punch bowl of Groult Reserve Calvados, Red Breast 12 whiskey, lemon, China Amer, and birch. Warning: do not try bobbing for anything in this bowl as it will be ON FIRE. 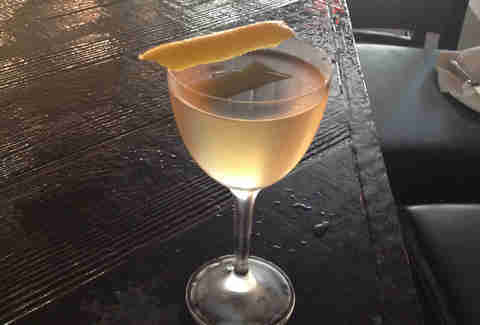 The West LA pizza joint's new drink is a mix of Overholt rye, Laird’s bonded apple brandy, Punt e Mes, Strega, old fashioned bitters, Orange, and cinnamon essence. Give your Grandpa two of these and watch him live up to the drink's name. What would fall be without a classic hot toddy? (The correct answer is nothing. It would be nothing.) Do the season right by ordering up this fireplace in a glass, which features WhistlePig rye, Zaya rum, Miguel Torres brandy 10yr Gran Reserva, Cointreau, King’s Ginger liqueur, lemon, honey, and, obviously, a cinnamon stick. Don't have more than two of these. Seriously, try and keep your cool as you sip a mix of El Dorado 8yr rum, fiery Hart 151, more rum, grenadine, lime, falernum, grapefruit, and bitters. Danny Jensen is a regular Thrillist LA contributor who is convinced that bobbing for apples in bourbon is going to be the next big thing. Show your support by following him on Twitter @dannyseamus.